Most anyone who has had a bank account for at least a few years is familiar with the traditional relationship between banks and customers—banks house the money, send the statements, and set the rules. Many people think of their bank as the “big bad wolf” who sets the terms of how money is used and comes after you with fees if you can’t manage your money correctly. It’s a necessary institution, but one that has long been feared by many customers. Things are changing, and how we interact with banks and money is transforming into a much more customer-friendly model. Instead of being afraid of banks, customers can now work with them to conveniently meet their financial goals. One of the leaders of the movement is Zelle, a peer-to-peer payment system that allows users to instantly send money through a secure app. Zelle is actually owned by seven of the world’s largest banks with the goal of creating a consumer platform that is fast, safe, and works across banks. It’s a far cry from the old attitude of banks that only cared about how many customers they could get to open accounts. Today, banks care more about creating a good experience for customers and providing them with the tools to make banking easy and accessible. In many cases, banks are pivoting to more advisory roles and expanding their services and relationships. The relationship between customers and banks is changing in large part because new technology allows banks to use various platforms to deliver services that are faster and more convenient for customers than they could have done in the past. Zelle and many other banking apps would not have been possible even just a few years ago, but with advances in mobile technology, it’s not only now possible but safe and convenient. Technology also allows banks to provide more options to customers. It used to be that if customers had to do any kind of banking, their only option was to go into a physical branch and talk with a banker. Now, mobile and online banking make it much more convenient for customers to get their banking done on the go. Modern customers love to self-serve, and banking apps make that possible. Instead of having to talk to a teller to deposit a check or wire money to a friend, it can now be done with just a few clicks in an app. Of course, physical locations are still available for people who want face-to-face interactions or have more complicated issues, but just having the option to bank in a way that is convenient for each customer is a huge change in modern banking. The evolution of money is far from over. Changing payment options will likely affect how customers make purchases. Rose Corvo, the marketing lead for Zelle, says her company’s main goal is for people to use less cash and checks and instead use instant peer-to-peer payments. As artificial intelligence grows, it will also become more of a force in the financial world. AI will be able to notice trends in a customer’s account and then initiate a conversation about how the problem can be fixed. For example, if AI notices that a customer keeps overdrawing their account, it can notify a human to call the customer or contact them directly to discuss options and other banking products to prevent future overdrafts. With new technology and options comes more opportunities for banks to advise their customers on how to be smarter with their money. Education is a huge goal of modern banks because educated customers are happier and more loyal to the brand. As technology advances and it becomes even easier to monitor and move money, banks will likely become a more convenient part of our lives. 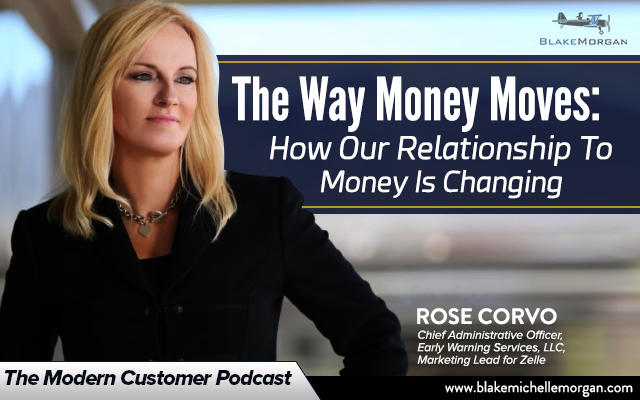 Our relationship with money is changing for the better, and it will likely continue to change as technology finds more ways to put customers first.